I caught this article written by the folks over at USA Today and I love to see the Inland Empire teams and players getting their props for the high caliber talent that is out there. I put the article below for you to read and tell me your thoughts about it. I even posted my very own opinion after the article to share with you. New UCLA coach Rick Neuheisel is pulling out all the stops. Before the season kicked off, UCLA ran a full-page ad in an area newspaper that said, “The football monopoly in Los Angeles is officially over.” Then the Bruins went out and upset Tennessee in Week 1. Last Friday, Neuheisel found a creative way to get out in front of as many L.A.-area recruits as possible in one night. After watching the nation’s No. 1 guard, Michael Philipp, play for San Bernardino Arroyo Valley at home against Pasadena, Neuheisel fought through Los Angeles’ traffic to make it to the Inglewood-Long Beach Wilson game. Neuheisel was there to check out four-star receivers Shaquelle Evans and Jemari Roberts. After watching Evans and Roberts, Neuheisel drove to the Hawthorne Airport and got in a helicopter to fly out to the Inland Empire to watch Bishop Amat (La Puente, Calif.) on the road against Los Osos (Rancho Cucamonga, Calif.). That game featured Bruin commits Richard Brehaut from Los Osos and cornerback Sheldon Price from Bishop Amat. 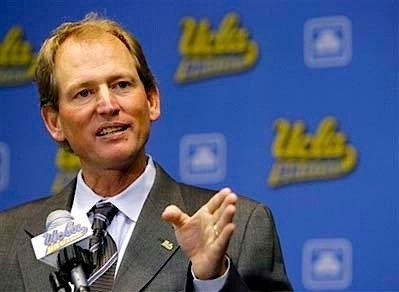 Neuheisel wasn’t able to land at the school as expected, and was forced to land at Ontario Airport. By the time he got to the game, it was over. Nevertheless, a big impression had been made. “It was awesome that Coach Neuheisel would have that much dedication to his recruits that he would come to our games in a helicopter,” Brehaut said. “He was never able to land even though he had permission from the school, but the sheriff didn’t allow him to land on our baseball field. UCLA assistants also were on the road. The Bruins sent two assistants to Utah to watch John Martinez and Xavier Su’a Filo play. Another assistant went to Oregon to watch Charles Siddoway, and others were in Los Angeles watching Brandon Sermons’ game in Pomona. What do you think about this article? Let me and the rest of the sports world know.